My wife and kids love Anne of Green Gables. But we sadly warn everyone not to watch the new season. Because nothing is safe anymore from the clutching tentacles of progressive political and sexual ideology – not even classic children’s literature and television. Family-oriented entertainment is being turned into propaganda. The story of Anne – an 11-year-old orphan girl adopted by a brother and sister on Prince Edward Island, Canada – was written in 1908 … not 2008 or 2018. 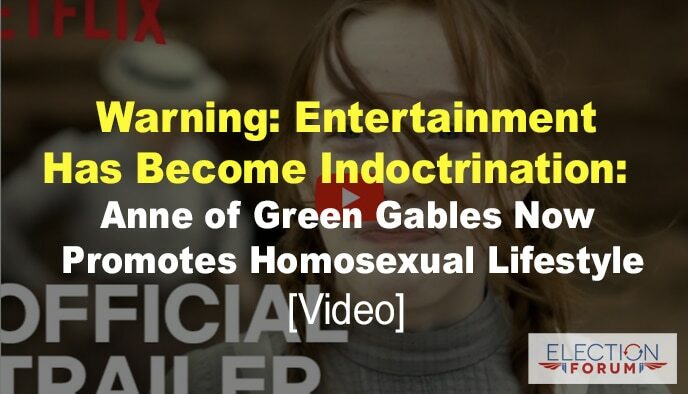 The message Netflix is clearly sending to all children and adolescents who love Anne of Green Gables is that homosexuality is good … and should be celebrated. The group has gathered to honor the memory of Josephine’s departed “partner,” Gertrude. “You have a life of such joy before you,” Aunt Josephine replies. Remember, the moral relativism and promotion of homosexuality in this Netflix series is specifically targeting young children and pre-teens. Remember, this is the network that is giving the Obama’s there own show. Dump NETFLIX NOW! we just canceled Netflix, so so they want to pollute young minds , check out pure flix we like it. No stone unturned, as they say. All must be corrupted and they get away with this crap. All of it enabled by 60 years of govt programs , indoctrination. Gary M.
If you need another reason to dump Netflux, watch the episode, “Miss Magic Jesus”, on the Netflix original show , “Insatiable”. Very offensive! The part you want to look for is the singing and dancing performance by the girls. Listen carefully to the lyrics. Unbelievable! Yep. I used to have Netflix but cancelled. Even Comics Marvels are pushing their homosexual agenda to kids. When Netflix stared, the client could control and choose what they wanted to stream, but they took that previlege away and now supporting all kinds of wrongs in their programing and even pushing it in program that should be for families. The reason we purchase Netflix was so we could control and choose what we wanted to watch on TV without companies imposing their agenda on my family. Now even Comics Marvel like Superwoman, Flash, etc and all the Marvel Comics they pushing the homo agenda. That is unbelievable. The US has turned into a toilet/cess pool.